Shopping can be hard. It requires patience, dedication, a keen sense for detecting an oncoming sale, and a well-honed fashion sensibility. Fortunately, though, there are a lot of startups out there that are eliminating these, as well as other barriers separating us from the wardrobe of our dreams. In this super-stylish edition of Startup Digest we’ll be taking a look at just how these mobile trendsetters make it easier than ever to explore the world of fashion, and take home a few shopping bags full of it as well. CREAM delivers curated fashions, dubbed «street styles,» to its users from the many designers, fashionistas, and bloggers already partnered with the startup. Users can then flip through the different styles, saving the ones they «heart» to a digital closet or buying them directly. What’s super cool about this app is that it combines the aesthetic of the fashion mag directly with the accessibility of e-commerce, so users can go from being inspired by the styles they see to expanding their wardrobe in a matter of minutes. CREAM is currently funded by a $100K seed from 500 Startups though I bet they’re also making a little something on each sale they generate. If you’re thinking of Brooklyn-izing your wardrobe in the near future, there’s no better way to start than by downloading CREAM for Android or iOS — it is free, after all. Sometimes the only way to find the right style for you is to spend a little time combing through racks of clothing at your local department store. If that’s your strategy, you might want to consider saving a little money on gas by downloadingGrabble instead. Grabble operates on the same logic as the dating app Tinder, though instead of singles on its articles of clothing you’ll be swiping right to like and left to discard. When you «grab» (like) something, it gets moved to a special folder where it will stay until you either buy it or remove it. Over time, the app learns your preferences so you’re more likely to be shown styles that suit your tastes. Cleverly, Grabble sends you notifications when items you’ve saved go on sale, a feature which contributes greatly to the larger goal of actually getting people to buy stuff. According to the app’s founders, London-based Daniel Murray and Joel Freeman, users tend to use the app for short periods of time when they’re bored (called «Snacking») and then buy everything they’ve saved when there’s a sale. In addition to the money they get from retailers, who pay a monthly fee and/or commission, Grabble just picked up a $1.2 million angel investment on February 20th. Grabble is totally free, and available in the App Store as well as Google Play. The testosterone-fueled premise of Dapper is to make it easier for men who hate shopping to be fashionable, and boy does it deliver. Dapper makes buying clothes as easy as shopping for them by offering a universal check-out system. You can also use Apple Pay if you’re shopping via iPhone. The brain behind this most manly of shopping apps belongs to Summit Partners alum Amir Malayery of San Francisco, who just received a half million in seed funding from undisclosed sources last October. Dapper is currently only available for the iPhone, though there’s a waitlist for the Android version which should be dropping later this year. Have you ever seen an outfit on the street and wanted to know where to find it? French startup Wheretoget is the answer… or at least the best place to ask the question. More a community than a curated fashion app, Wheretoget users post pictures of clothing items they’re looking for, and in an average of 24 hours receive crowd-sourced answers about where to find them and how much they cost. If you think 24 hours sounds like a long time to wait for answers, don’t worry, because about a third of inquiries get responses in 30 minutes or less. Wheretoget’s unique appeal is the range of social features it offers to users; there are newsfeeds, blogs, and chats, plus the ability to follow brands, hashtags, or TV shows. Hashtags don’t pay the rent, though, which is why Wheretoget also lets you buy clothes through third-party affiliates from whom it receives a fee. Started in 2013 by French duo Aurelian Appere and Romain Moyne, Wheretoget has received $2M in funding from Emmanuel Brunet, Fabrice Grinda, and Alven Capital. Though originally web-only, you can now find Wheretoget for free on Google Play and in the App Store. «Instant outfit ideas for everything» is the thought process behind Hangr, which comes to us from Vancouver-based team Justin Chan and Simon Hua. One of the app’s main features lets users scan a price tag or a Hangr Clothing Tag to show the user possible outfits put together with the product that the user is scanning. It’s just like shopping for clothes without having to try them on, or checking how they look on mannequins. Retails stores working with Hangr can increase sales by vizualizing the outfits they sell on life-style shots so that a buyer can fully understand the potential for that piece of clothing. To put their products on Hangr retail stores should give them the product list containing the products UPC codes and their outfit pictures through Hangr's web portal. You can download Hangr for free for both Android and iOS. If you thought customized style recommendation based on your body-type was cool, your head might explode when you see what Styliff has to offer. 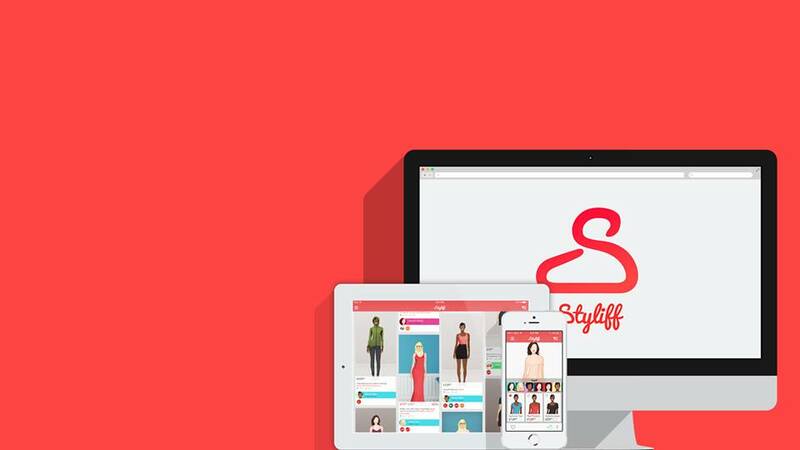 Styliff is combining e-commerce with augmented reality by letting users create 3D models of themselves which they can then use to try on virtual clothing, which can then be purchased through the app. Though it won’t be released until later this year, Styliff has the chance to change shopping as we know it. Imagine never having to try on clothes at the mall again (sorry Hangr), or sending back something you ordered because you thought it would look great. Take a look at Styliff’s website and you’ll see that the team has already thought a lot about how to monetize. Retailers and designers can get their clothing «virtualized» for free, but after a three month trial period will have to pay a 6.5% commission on all purchases plus a penny or 2 for likes/shares on social media. Styliff is the brainchild of graphic designer Grega Trobec and programmer Konrad Zuwala, who run their team from Brazil. So far they’ve received $50K in funding from Angel investor Luciana Fonseca, but expect to see a lot more if the initial web/smart-phone launch is a success. If you’re thinking of making your 2015 debut on the fashion-app runway, consider giving the fashionistas at Yalantis a call first. We’ll help you design and execute a fabulous mobile product that will leave your audience stunned.